Resealable, pop-up packaging for easy use. 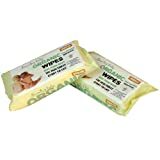 The highest quality ingredients mean our organic baby wipes are incredibly soft and gentle on baby’s skin. 98% of BABIES SUFFER from Nappy Rash, Eczema, Asthma or Sensitive Skin Problems in their first three years of life. Many of these problems can be easily solved by avoiding the HARSH CHEMICALS that the BIG CORPORATIONS insist on putting into standard baby products. We have stripped out these chemicals to ensure that YOUR BABY only comes into contact with the most gentle, natural and organic ingredients. This entry was posted in Organic Health Products and tagged Baby, Beaming, Organic, Packs, Wipes by Organic Health. Bookmark the permalink.